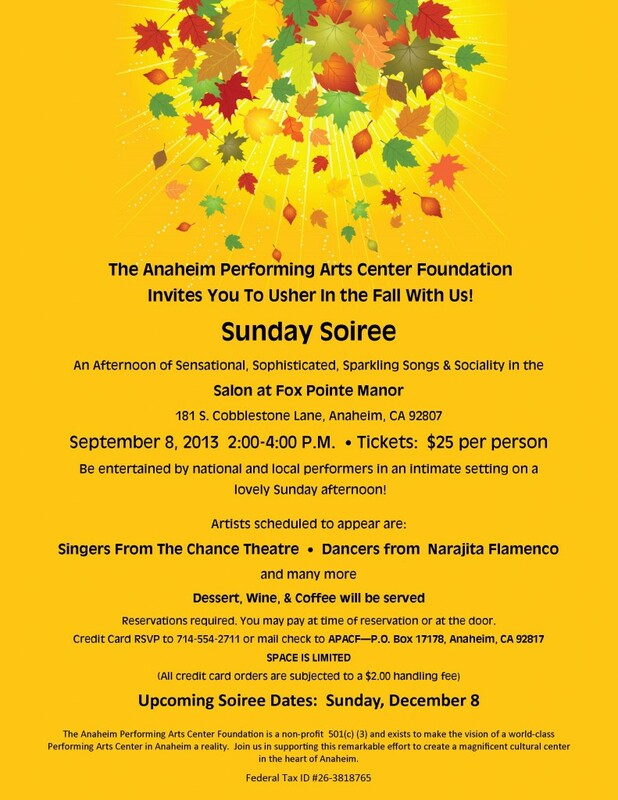 This Sunday, I will be performing at the monthly Singers Soiree in the Salon at Fox Pointe Manor hosted by the Anaheim Performing Arts Center Foundation. There will be many talented guests showing their stuff including my good friend Erika C. Miller of The Chance Theatre, The Narajita Flamenco Dancers and one of my super talented students, Miss Maggie Gidden. Here's a video of Maggie and another amazing Student Miss Keely Gaeta singing with me 3 years ago at The Anaheim White House. I'm so excited about the growth I've seen in these girls. Total rock stars. I'd love to see you at this great event! September 8, 2013 2:00-4:00 P.M.
Tickets: $25 per person – Desert, Coffee and Wine will be served! Reservations required. You may pay at time of reservation or at the door. I didn’t think I knew who the Narajita Flamenco Dancers were… so I just did some research on their company. Turns out – last weekend, we accidentally stumbled on their studio in Anaheim. There was an older man playing beautiful music on his guitar and my son Frankie was mesmerized! I can’t believe it’s the same group performing on Sunday! Hope to see you there!